You may have gathered from the last entry that I was determined not to repeat last Friday’s “Jonny-no-mates” routine again, so in a desperate effort not to appear to be a social pariah I asked a group of work colleagues whether they would like a “swift one” after work this Friday. 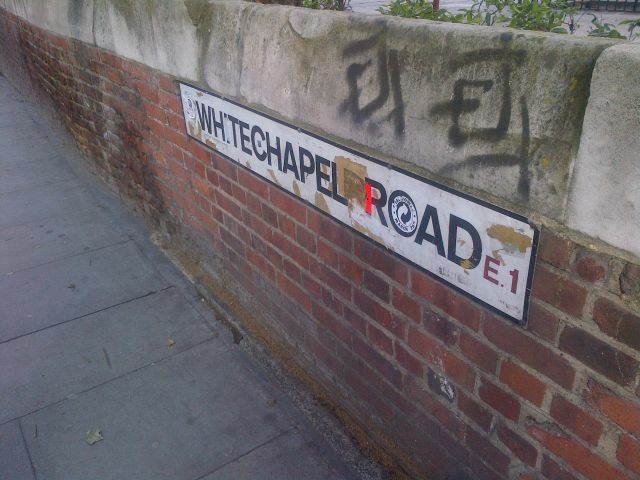 Luckily the next square on the board, Whitechapel Road is only a brisk 10 minute walk away from our offices and as such I wouldn’t need to put this gallant gang of volunteers through a forced march to get to the pub. 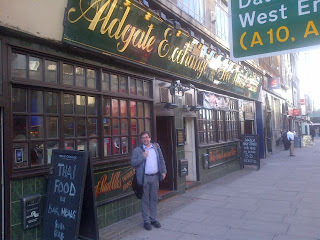 The nearest Cask Marque pub is the Aldgate Exchange just 50 or so metres down from Aldgate East tube station. I’d previously been in this place and been unable to find the Cask Marque certificate so I thought it might be a prudent step to visit somewhere else on the way. 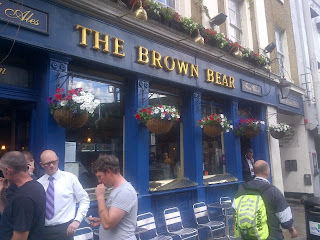 My selection was The Brown Bear in nearby Leman Street which caused one work colleague to squeal with both delight as this is apparently one of her favourite pubs and then groan in agony as she couldn’t join us due to other commitments. 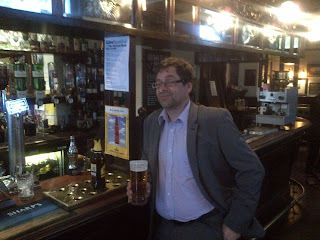 So it was with somewhat of a spring in our collective steps that 5 of us entered the pub on an early Friday evening. The pub is a traditional centre bar affair with nice wooden shelving atop which stands the proud statue of the Brown Bear. 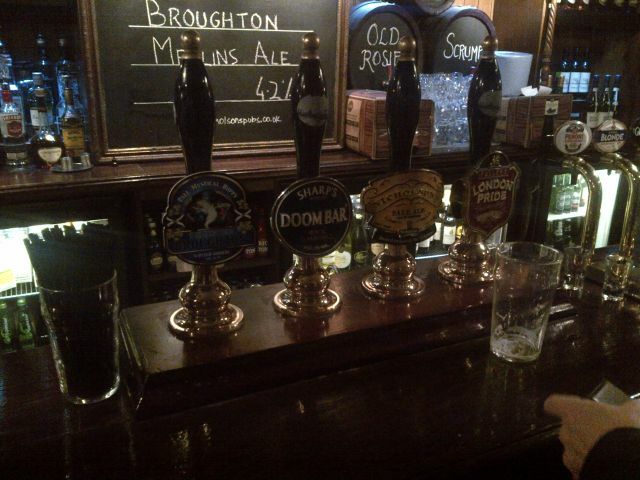 Beers on offer were Fuller’s London Pride, the ubiquitous Sharp’s Doombar and Marston’s EPA. Only the Pride and the Doombar had the Cask Marque tag on the handpumps which perhaps should have given me a clue as the EPA was rather warm and woolly (and also served in an Adnams Glass (Grrrrrrr)). With the pub just starting to fill up and Andy Murray just losing the 3rd set in his semi-final, like a bunch of wannabe tabloid reporters, 3 of my colleague all made their excuses and left, citing “busy days tomorrow” and “friends coming round tonight”………………….lightweights to a man! This left me with spiky haired Ed. Spiky haired Ed is a curious creature, presenting the attractive face of IT with his chiselled jaw, fresh complexion and gymnasts physique he’s very much the eye candy for the office girls. Where as I present the slobbish side of IT with my stupid fat face, binman’s physic and most of the office girls having exclusion orders against me so I don’t get within 5 feet of them. Anyway, as a modern day “odd couple” we strolled up to the junction of Aldgate High Street and Commercial Street and took a swift jaunt up the Whitechapel Road to record the visit for posterity. Well at least you can read this sign! It was then back to the Aldgate Exchange for a rather nasty pint of Adnams Southwold bitter (not served in an Adnams glass (Grrrrrrrrr)). I had always presumed that this place was another Weatherspoon’s pub (based on the style of the outside signage) but it turns out it isn’t. I’m not sure if it is a Free House as they claim but it’s another open plan pine floored warehouse with not a great deal going for it. The staff were friendly and the manager was more than happy to fetch out the Cask Marque certificate which wasn’t on the wall. 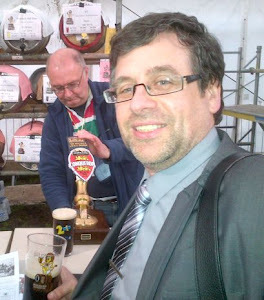 “How did you like the beer?” he asked as I scanned the code. I went all English and didn’t want to make a fuss, “Oh, very nice” I lied. One (fat) man, a man-bag and a sign in misleading typeface. Spiky haired Ed and I were now on a roll, putting the office to rights and deciding who was probably overpaid (everyone else) and who were underpaid (spiky haired Ed and me) so we decided to continue the journey across the road at The Hoop and Grapes, a Nicholson’s pub where apparently the Great Fire of London stopped just 50 yards away. The best pint of the evening was the 4.2% Merlin’s Ale and it was only a pity the visit to this very nice pub was spoilt by them not being in possession of the new style Cask Marque certificate with the QR Code. Before things started to become maudlin Spiky haired Ed and I called it a day and bidded each other a good night. Him, back to his boy-band lifestyle of hair gel and pegged jeans and me to onion rings on Reading station. Cheers! Target for the visit = Successful! Next Stop = Income Tax!